Svetlana Alexievich was born in 1948 in the Ukrainian town of Ivano-Frankivsk, as the daughter of a Belarusian father and a Ukrainian mother. When her father had completed his military service, the family moved to Belarus, where both parents worked as teachers. After finishing school, she studied journalism at the University of Minsk. After her graduation in 1972 she worked on a local paper in Brest near the Polish border. She later returned to Minsk and joined the newspaper Sel'skaja Gazeta. For many years, she collected material for her first book U vojny ne ženskoe lico (War's Unwomanly Face). This is based on interviews with hundreds of women who participated in the Second World War, and it became the first title in Alexievich's grand cycle, Voices of Utopia, where life in the Soviet Union is depicted from the perspective of the individual. By using carefully composed collages of human voices, Alexievich deepens our comprehension of an entire era. Černobyl'skaja molitva (Voices from Chernobyl: Chronicle of the future,) explores the consequences of the nuclear disaster in Chernobyl in 1986. Cinkovye mal'čiki (Zinky Boys: Soviet voices from a forgotten war) is a portrayal of the Soviet Union's war in Afghanistan 1979–89. Her latest book, Vremja second chènd (Second-hand Time: The Demise of the Red (Wo)man), came out in 2013. 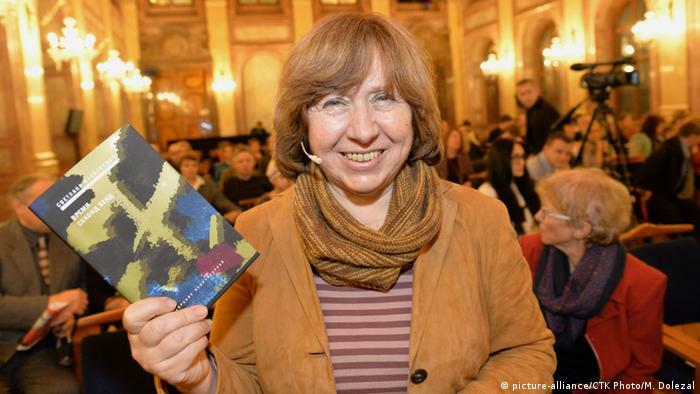 Following the announcement of the Nobel Literature Prize for 2015 Sara Danius, Permanent Secretary of the Swedish Academy, which makes the award, said Svetlana Alexievich's work is “not really about a history of events. It's a history of emotions."